Every year we write down our to-do list for the next 12 months. YES….it is lofty. YES…we will fail. YES…I always look like a fool. And I own it. Watch me wear fool like Michelle wears J.Crew. But lofty is good when it comes to to-do lists. If you only ever put things on your to-do list that you will actually DO, then you won’t have a list anymore. You will become bored with life and die. I’m kidding of course….but it could happen theoretically. And I don’t want to die….so here is our 2019 DIY To-Do List. Oh and quick disclaimer – some of these things we started in 2018 and never actually finished so this list includes those items as well…don’t judge….we never finish everything on the list…. Garage– we did make a little progress this past year. We switched out the lights which was nice and we got more work tables. Our garage doors are falling apart so we need to do something about that. And we have a REALLY big project in that we want to clear everything out and buff the floor of the entire space…sortof as a test to see what our flooring looks like and if it has held up. Ella’s Nursery – I have officially started on the nursery but it is being kinda a headache. I have that accent wall in there that I love but I also kinda wanted to do wallpaper or vinyl decals and I waffle on thinking it might be too much. That being said…I’m just gonna have to forget ‘perfectionism’ and just go for it. Big Red – our long awaited travel trailer is just sitting in our driveway being neglected. Big Red is the name….being ignored is his game. He has joined the masses of travel trailers all over the US in being demoed but not finished. PLEASE let this be his year! Monroe House – Last year we made major progress on the Monroe House (demo, reframing, re-roofing, structural chaos)….and we are doing it all on a pay to play plan. So we save…we do….we save….we do. We have enough saved to do the rest of the exterior and we are just waiting on the contractor to become available again. He is behind on all his projects because we have gotten soooo much rain. And the good news is that we just got word he is gonna be on our project this next week. #freakingout The outside is the game plan this year….windows, doors, siding, porches, basic landscaping, a possible deck. Then we start the inside….I’m hoping 2019 we get more done than just the exterior. Outdoor Court – we are sooooo close. We have the court painted, the hoops installed, the fence built but we need to paint the lines and then move on to some minor things…storage, seating, etc. But SOOO close. Closets (Mine, Big Boys, Ella’s) – I am nearing in on the finish line for my closet. The big boys have their closet close to being done. Ella’s is next. Foyer – I just have ONE stinking piece of furniture to build. ONE. And then I will do a little shushing and call it a day. By the way – this is the last photo I could quickly find of the foyer. Remind me to organize my photos when I have….oh…ten years. Playroom – the playroom is a constant crazy place. The toys are constantly changing. The space is constantly changing. I want to just build a closed closet area in there to officially make it qualify as a bedroom and then I can put some storage in there (rotating toys, arts and crafts stuff, etc.) I think it would better suit us as a family. But it would mean the one thing that I hate….drywall work. Ella’s Bathroom refresh – this should be fairly simple…switch out the art, change out the mirror, add some girly touches. It is already beautiful but it just could reflect her a little more. 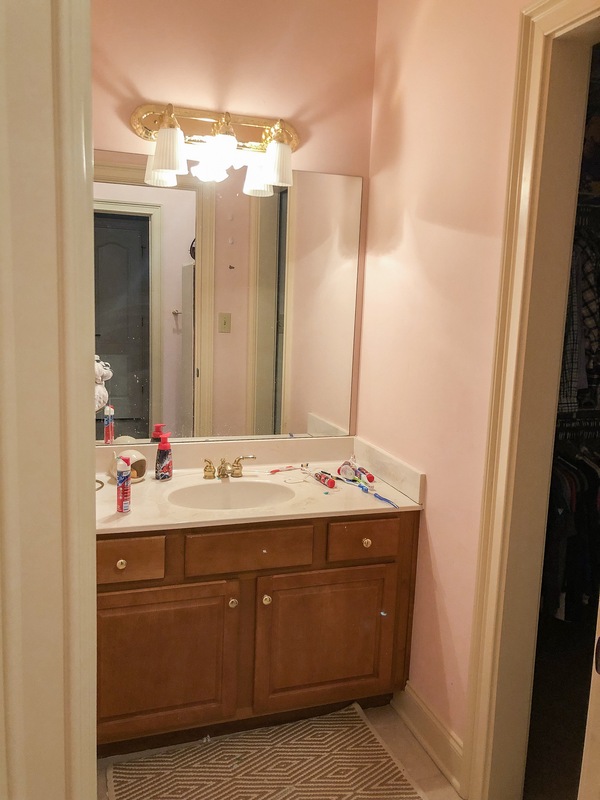 Big Boys bathroom – speaking of bathrooms, the big boys have a sink area (part of the jack-n-jill setup we have between the boys bedrooms) and it is still rocking pink. Like original tan trim and baby pink walls. They have requested a bathroom makeover and I am excited to deliver that. Basement Floor – I decided that this year I also want to install luxury vinyl plank flooring in the basement. That would mean the dining room, the hallways, the living area, the front rooms, the whole shebang. It would be a giant job but well worth it in the end. Office – I have an office right off the living room and I have rearranged it ten thousand different ways. It’s time to get it working FOR REAL. I need storage and organization and privacy. This is the way it looked the last time you saw it in 2016. Well…it’s all different now. And it still has a long way to go. That’s it! That’s our list! I feel like it’s not completely doable….but that’s a good thing. That’s a motivator. More than likely we will ‘fail’ but in that we will also come out as winners because so much will get done! Also, Jeremy and I have a really big passion project that we are thinking about lately. It’s something we will let you know about if it comes to fruition.